I have been chomping at the bit all winter to get started on my guitar project. I have been waiting for the weather to warm up so I can get outside and do some sanding. I have been playing guitar off and since I was a teenager and I have always wanted to create an electric guitar myself. Over a year ago I found some information about how to paint your own guitar using spray cans. I did some research and found some glowing reviews on this method of guitar building. The method I found can be found at this web site. I purchased their electronic books and I received a ton of information including instructions with pictures, video, guitar graphics templates, and so many more resources. Armed with these resources I proceeded to get online and find an electric guitar body, neck and hardware (electronics and such). Ebay here I come. I selected a Stratocaster type body made of Adler wood which is a decent type of wood for sustain which is important for some of the music I like to play. I found a nice looking Yamaha Stratocaster type neck where the fret board looked barely worked in. I purchased two Mighty Mite single coil pickups and a Seymour Duncan Screamin’ Demon humbucking bridge pickup. It will scream! I got all chrome hardware that will go nicely with the color I intend to paint my guitar. The color and pattern is going to be orange and white checkerboard just like the end zones of my favorite college football team. Over the winter I put the body and neck together and installed all of the electronics and hardware to see how it would all sound together. I can honestly say it really sounded great. The Seymour Duncan humbucker screamed through some Van Halen, and when I selected the neck pickups the blues had some really great tone. So this past Saturday I pulled the guitar out of my basement and removed all of the hardware, took apart the body and neck and began sanding off the original paint from the guitar body. I will be reporting several of the stages of the project on my blog. Hopefully it won’t bore my regular readers. Yeah all two of you. Above is the first picture. I can’t wait to rock. Did that in the late 80’s. 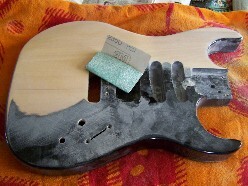 It was a lefty Strat body- alder wood. The Rosewood neck didn’t quite fit, so it had to be adjusted. I had a locking tremelo kit, some humbuckers, and painted red. Looked okay, but I wasn’t happy with it. I was in over my head. Sounds like you aren’t. Enjoy it! Because of other projects this one was put on hold. I will be going back to it when the weather gets warmer this spring. There will more posts and pictures forthcoming. Thanks for the comment.